This nonprofit used a Fund a Need to raise money to build hurricane-proof homes in Haiti. 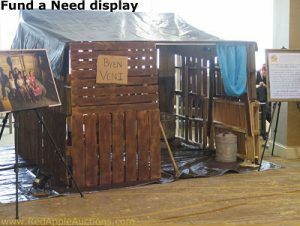 This was the display, representing a typical Haitian home. Later this month (June 26, 2017) I’ll be speaking at Planet Philanthropy, the annual statewide conference presented by the Association of Fundraising Professionals Florida Caucus. My topic will focus on Fund a Needs. As I prepare for that talk, I want to revisit a blog post I wrote for fundraising consultant Lori Jacobwith last year, when she asked me to speak to her Ignite Fundraising Club members in January 2016. Here’s my take on why nonprofits – primarily smaller ones – should bypass silent auctions and focus on running strong Fund a Needs. As a benefit auctioneer, I oversaw 54 nonprofit fundraising events in 2015. Six had no auction. That means I was an auctioneer working at events with no auctions. Here’s what I was doing: I oversaw a process called a Fund a Need. The Fund a Need, or FAN for short, is called by many names — special appeal, paddle raiser, mission moment, to mention a few. It’s a process for soliciting spontaneous donations at your event. It typically raises thousands of dollars, even at the smallest of events. What I’d like to propose today is that small nonprofits may want to consider the possibility of eliminating their silent auctions and instead work on getting really, really good at running Fund a Needs. Here are four reasons why you may want to skip the silent auction and focus on the FAN. Running a silent auction takes a team of volunteers and/or staff. They are tasked with soliciting items, packaging items, displaying packages, staffing the tables, closing the tables, delivering the items, and … whew! The work starts months in advance. Contrast that with a Fund a Need. For many groups, in less than eight hours of pre-event work, they run a strong Fund a Need whose revenues will rival or surpass many small silent auctions. I’ve seen a few silent auctions which had such well-curated items that they represented the mission of the nonprofit. But that’s rare. Silent auctions usually are a mishmash of items designed (rightfully so) to appeal to a broad range of guests. In contrast, Fund a Needs are focused on the mission. They are about telling inspiring stories, sharing mission-centric causes, and inviting participation to supporting shared beliefs. That’s all good stuff to communicate to a crowd of fans and could-be supporters. 3. Raise funds more easily. National averages show that silent auction returns are in the 50% to 65% range. That means for every dollar of value donated, the nonprofit keeps $0.50 to $0.65. That’s not good. On more than one occasion, my clients have told me that the FAN was ‘free money.’ Whatever came in, they were thrilled to have — especially given that it was so little effort expended on their part. In all but the rarest of circumstance, the donations were significantly more than what they thought they’d raise. There are certain logistical requirements for a silent auction. You need tables, display items, and props. You need space. You need to think about flow. If outside, you need to account for natural elements, like wind and rain. With a Fund a Need, these logistical requirements nearly vanish. You can run a FAN in big spaces or small ones. I’ve overseen them in furniture stores, hotel ballrooms, and barns. They are more easily inserted into a program than a silent auction is. Intrigued? Join me at Planet Philanthropy to learn the ins and outs of running these activities.